Loss of papillae, formation of open interdental spaces. Food impaction beneath the pontic. Class I - Buccolingual loss of tissue with normal apico coronal ridge height. Class II - Apico coronal loss of tissue with normal buccolingual ridge width. Class III - Combination of both buccolingual and apico coronal loss (both width and height). Type A - Apico coronal loss of ridge contour. Type B - Buccolingual loss of ridge contour. Type C - Combination of both buccolingual and apico coronal loss. Pink ceramic in the cervical portion of the pontic. Removable tooth mask made of pink silicone material. A 45-year-old male was referred to the Department of Periodontics, Krishnadevaraya College of Dental Sciences and Hospital, for ridge augmentation, prior to fixed partial denture replacement. The medical history was non-contributory. The dental history revealed loss of mandibular anteriors due to trauma, six months back. A periodontal examination revealed chronic generalized gingivitis. Evaluation of the edentulous space revealed Siebert's class III ridge defect i.e., loss in height and width of the alveolar ridge [Figure 1]a. In order to create an emergence profile and soft tissue contour around the fixed partial denture, we considered this case for soft tissue augmentation using a free gingival onlay graft harvested from the palate. Clinically, there was a Siebert class III defect in the mandibular anterior region measuring about 3 mm in height and width. [Figure 1]a and b. Hence, this patient was treated with soft tissue ridge augmentation, by using an onlay graft from the palate. Prior to the surgery, patient was asked to rinse with 10 ml of 0.2% chlorhexidine, for a period of one minute and local anesthesia was administered. A no. 15 B.P blade was used to de- epithelize the recipient site extending from the mesial aspect of the left mandibular canine to the mesial aspect of the right mandibular canine region [Figure 1]c. The margins of the recipient site were beveled. Hemostasis was obtained with a surgical gauze moistened with saline. A template was made with a tin foil. Local anesthesia was administered. The template taken from the recipient site was adapted to the palatal region. The incision extended from the mesial of the second premolar to the edentulous area of the maxillary first molar midway between the gingival margin and the midline raphae. A free gingival onlay graft measuring 4 mm in height and width was harvested from the palatal region. Hemostasis was obtained. The onlay graft was placed over the recipient site and stabilized using sutures. [Figure 1]f and periodontal dressing was placed. Postoperative instructions were given to the patient. Home instructions included twice daily 0.2% chlorhexidine mouth rinse for a period of two weeks. Postoperative antibiotics and analgesics were prescribed (Amoxicillin 500 mg thrice daily for 5 days and Combiflam thrice daily for 3 days). The sutures were removed 15 days after the surgery, and the patient presented with uneventful wound healing. Monthly follow-up appointments were scheduled for a three-month period [Figure 1]g. Following 3 months of uneventful graft healing permanent FPD was given. A 25-year-old male was referred to the Department of Periodontics, Krishnadevaraya College of Dental Sciences and Hospital, by the Department of Prosthodontics, for ridge augmentation, prior to prosthetic rehabilitation with dental implants. The medical history was non-contributory. The dental history revealed loss of maxillary central incisors due to periodontal disease one month back. Evaluation of the edentulous space revealed Siebert class III ridge defect i.e., loss in height and width of the alveolar ridge [Figure 2]a. In order to place an implant, the ridge defect was planned to be corrected using Guided bone regeneration technique using hydroxyapatite bone graft (Bone-medik) TM with a resorbable collagen (Heali-guide) TM membrane. Prior to the surgery, patient was asked to rinse with 10 ml of 0.2% chlorhexidine, for a period of one minute. Local anesthesia was administered. A no. 15 scalpel blade was used to give a crestal incision, extending from the mesial aspect of the left maxillary lateral incisor to the mesial aspect of the right maxillary lateral incisor, over the defect. Two vertical releasing incisions were made and a full thickness mucoperiosteal flap was reflected [Figure 2]d and e, hemostasis was obtained and alloplast graft material (Bone - medik) TM was placed over the deformity [Figure 2] and covered with resorbable collagen membrane (Heali-Guide) TM [Figure 2]. The flap was placed back in position and sutured. [Figure 2], and periodontal dressing was placed [Figure 2]. Post-operative instructions were given to the patient. Post-operative antibiotics and analgesics were prescribed (Amoxicillin 500 mg thrice daily for 5 days and Ibuprofen thrice daily for 3 days) and twice daily 0.2% chlorhexidine mouth rinse for a period of two weeks was recommended. The sutures were removed 15 days after the surgery, and the patient presented with uneventful wound healing. Monthly follow-up appointments were scheduled for a period of six-month IOPA and postoperative models after six months showing improvement in ridge contour [Figure 2] j, [Figure 2]. Bone augmentation techniques may be used for the horizontal ridge augmentation, vertical ridge augmentation, and sinus augmentation. To maximize the results for each of these applications, a variety of different techniques are employed. They include particulate grafting, membrane use, block grafting, and distraction osteogenesis, guided bone regeneration either alone or in combination. Guided bone regeneration was introduced by Hurley in 1959 when cell-occlusive membranes were employed for spinal fusions. GBR is based on the same principles as GTR. GBR refers to the promotion of bone formation alone. A predictable intraoral GBR approach was developed in the late 1980s and early 1990s; it has become a predictable surgical methodology to enhance new bone formation in peri-implant bone deficiencies and alveolar ridge augmentation. A variety of bone grafts and non-resorbable and bioabsorbable barrier membranes has been used in bone augmentation with the GBR concept. Use of alloplast bone grafts hydroxyapatite and resorbable collagen membranes have shown predictable results. Careful diagnosis and surgical-prosthetic treatment planning with joint consultation prior to surgery should be performed in order to attain optimal esthetic results. Various techniques exist for correction of a deformed ridge. Correction of a localized ridge defect with soft tissue augmentation is a valuable method for fixed prosthodontic therapy. It not only improves the mucogingival aesthetics of the pontic region, but also prevents phonetic problems; and with the advent of osseointegration and implant therapy, hard tissue augmentation with bone grafts is more predictable. 1. Newman MG, Takei HH, Klokkevold PR, Carranza FA. Caranza's Clinical periodontology. 10 th ed. St Louis: Elsevier (Saunder's); 2006. p. 301. 2. Lindhe J, Karing T, Lang NP. Clinical Periodontology and Implant Dentistry. 4 th ed. New Delhi: Jaypee Brothers; 2003. p. 576. 3. Seibert JS. Reconstruction of deformed, partially edentulous ridges using full thickness onlay grafts. Part II Prosthetic\periodontal interrelationships. Compend Contin Dent Educ Dent 1983;4:549-562. 4. Studer S, Naef R, Schärer P. Adjustment of localized ridge defects by soft tissue transplantation to improve mucogingival aesthetics: A proposal for clinical classification and a n evaluation of procedures. Quintessence Int 1997;28:785-805. 5. Reem Haj-Ali, Mary P. Walker. A Provisional fixed partial denture that simulates gingival tissue at the pontic-site defect. J Prosthodont 2002;11:46-8. 6. Liu CL. Use of a Modified Ovate Pontic in Areas of Ridge Defects: A Report of Two Cases. J Esthet Restor Dent 2004;6:273-83. 7. Barzilay I, Irene T. Gingival Prostheses-A Review J Can Dent Assoc 2003;69:74-8. 8. Edward Cohen S. Atlas 0f Cosmetic And Reconstructive Periodontal Surgery. 2007: 3 rd ed. Bc Decker: Hamilton; 2007. p. 327-46. 9. Sato N. Periodontal Surgery-A Clinical Atlas. Misch OE. Contemporary Implant Dentistry. 1 st ed. St. Louis: Mosby Co; 1999. p. 455. 10. McAllister BS, Haghighat K. Bone Augmentation Techniques. J Periodontol 2007;78:377-96. 11. Veisman H. The palatal roll". Soft tissue ridge augmentation using a subepithelial connective tissue pedicle graft. Oral Health 1998;88:47-51. 12. Sedon CL, Breault LG, Covington LL, Bishop BG. Subepithelial Connective Tissue Graft: Part 1. Patient Selection and Surgical Techniques. J Contemp Dent Prac 2005;6:146-62. 13. Scharf DR, Tarnow DP. Modified roll technique for localized alveolar ridge augmentation. Int J Periodontics Restorative Dent 1992;12:415-25. 14. Harris RJ. Soft tissue ridge augmentation with an acellular matrix. Int J Periodontics Restorative Dent 2003;23:87-92. 15. Watzinger F, Luksch J, Millesi W, Schopper C, Neugebauer J, Moser D, et al. Guided bone regeneration with titanium membranes: A clinical study. Br J Oral Maxillofac Surg 2000;38:312-5. 16. Pelo S, Boniello R, Gasparini G, Longobardi G, Amoroso PF. Horizontal and vertical ridge augmentation for implant placement in the aesthetic zone. 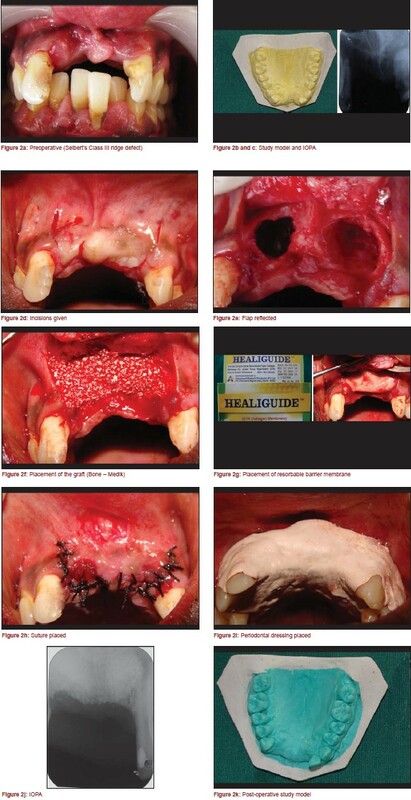 Int J Oral Maxillofac Surg 2007;36:944-8. 17. Proussaefs P, Lozada J. The use of resorbable collagen membrane in conjunction with autogenous bone graft and inorganic bovine mineral for buccal/labial alveolar ridge augmentation: A pilot study. J Prosthet Dent 2003;90:530-8. 18. Strietzel FP, Reichart PA, Graf HL. Lateral alveolar ridge augmentation using a synthetic nano-crystalline hydroxyapatite bone substitution material (Ostim®). Preliminary clinical and histological results. Clin Oral Implants Res 2007;18:743-51. 19. Block MS, Chang A, Crawford C. Mandibular alveolar ridge augmentation in the dog using distraction osteogenesis. J Oral Maxillofac Surg 1996;54:309-14. 20. Engelke WG, Diederichs CG, Jacobs HG, Deckwer I. Alveolar reconstruction with splitting osteotomy and micro fixation of implants. Int J Oral Maxillofac Implants 1997;12:310-8. 21. Sethi A, Kaus T. Maxillary ridge expansion with simultaneous implant placement: A 5-year results of an ongoing clinical study. Int J Oral Maxillofac Implants 2000;15:491-9. 22. Moloney F, Tideman H, Stoelinga PJ, de Koomen HA. Interpositional bone-grafting of the atrophic edentulous mandible. A review. Aust Dent J 1985;30:211-9. 23. Emtiaz S, Noroozi S, Caramês J, Fonseca L. Alveolar vertical distraction osteogenesis: Historical and biological review. Int J Periodontics Restorative Dent 2006;26:529-41. 24. Cruz M, Reis CC, Mattos FF. Implant-induced expansion of atrophic ridges for the placement of implants. J Prosthet Dent 2001;85:377-81. 25. Jae Eun Chung, Tae Il Kim, Yang Jo Seol, Yong Moo Lee, Young Ku, In Chul Rhyu, et al. Correction of anterior ridge defect for conventional prosthesis. J Korean Acad Periodontol 2008;38:729-36. 26. Shetty A, Jagtap R. Plastic surgery for alveolar ridge-augmentation using subepithelial connective tissue graft in prosthetic rehabilitation. Sci J 2009;3:1-4.